President Obama marked the end of the United States' almost nine-year war in Iraq on Monday, saying at an appearance with Iraqi Prime Minister Nouri al-Maliki that the final U.S. troops leave Iraq this year "with their heads held high." Mr. Obama is taking something of a victory lap this week for fulfilling his campaign promise to end the war, which will effectively end when the several thousand remaining troops exit the country by December 31. On Saturday, he thanked service members at the annual Army-Navy football game; on Wednesday, he and first lady Michele Obama will visit Fort Bragg in North Carolina to speak to troops about the war. 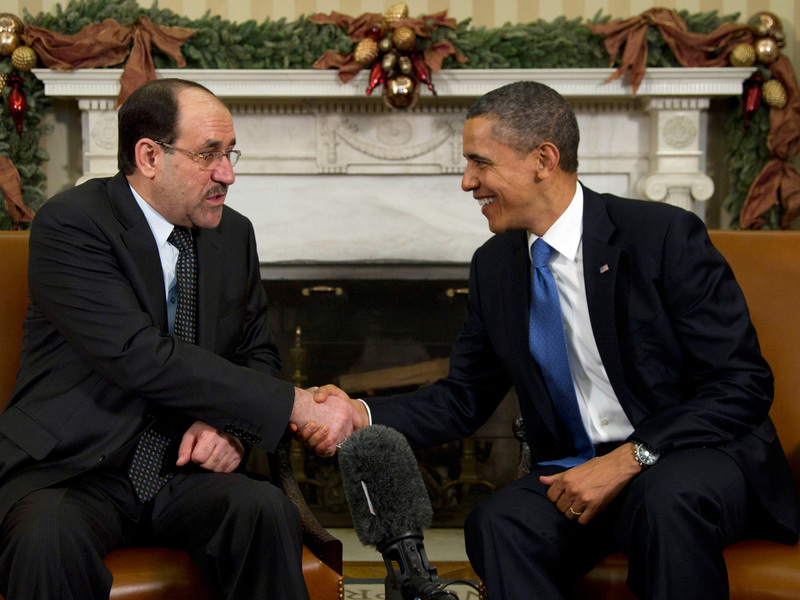 "This is a season of homecomings," Mr. Obama said Monday at the White House, flanked by al-Maliki. "Military families across America are being reunited for the holidays." Mr. Obama's decision to end the war - in keeping with a timetable first put in place under former President George W. Bush - has been popular with the American people, with even one in two Republicans saying they approve of his handling of the issue. Obama and al-Maliki met Monday to discuss the strategic relationship between the countries, which Mr. Obama described as an "equal partnership based on mutual interest and mutual respect." He described Iraq as "sovereign, self-reliant, and Democratic," telling the Iraqi leader, "You have a strong, enduring partner in the United States of America." Despite the positive rhetoric from Mr. Obama, the U.S. troop withdrawal comes at a time when it is far from clear that Iraq will be able to maintain its security and a health political system - and with Iran seeking to expand its influence in Iraq and in the region as a whole. Both Iran and Iraq are majority Shiite, and there are ties between the two countries' political establishments; it is not clear whether Iraq will become a safe haven for America's enemies once the United States fully leaves the country. Mr. Obama said Monday that "Iraq faces great challenges, but today reflects the impressive progress that Iraqis have made." He said Iraqis are "working" to build "efficient and independent and transparent" institutions. He said "our goal is simply to make sure that Iraq succeeds," telling reporters that a successful Iraq - one that unites various ethnic groups under one government - can be a model for the entire region. Asked if he still agrees with his onetime characterization of the Iraq war as a "dumb war," Mr. Obama responded, "History will judge the original decision to go into Iraq, but what's absolutely clear is that...what we have now achieved is an Iraq that is self-governing, that is inclusive, and that has enormous potential." "I have no doubt that Iraq can succeed," he said, arguing the United States is leaving Iraq "responsibly." Al-Maliki, speaking through a translator, said Iraq had established a democratic political process and "is following a foreign policy in which it does not interfere in the affairs of others and does not allow the others to intervene in its own affairs." Though its troops are leaving the country, the United States has its largest embassy in the world in Baghdad, with more than 15,000 people stationed there - an issue the two leaders were asked about Monday. Al-Maliki said he is in discussions about the size of the U.S. embassy presence, which is a strategic resource for the United States in the region. "We don't want to create big footprints in Iraq," Mr. Obama said - but he added that the United States wants to maintain a "very active" relationship between the two nations' militaries in terms of training and assistance. He said the "actual size of our embassy with respect to diplomats is going to be comparable" to similar countries, but that "special security needs inside of Iraq" mean there are a larger number of people stationed at the embassy overall. "We're only a few years removed from an active war inside of Iraq," he said, before adding of those stationed at the embassy, "I want to make sure that they come home, because they are not soldiers." According to Businessweek, the United States has 8,000 military personnel and 5,000 contractors remaining in Iraq, all of whom are set to depart. There were approximately 300,000 Americans in the country in 2007, nearly half of whom were contractors. "A war is ending," Mr. Obama added. "A new day is upon us. And let us never forget those who gave us this chance: the untold number of Iraqis who've given their lives; more than 1 million Americans, military and civilian, who have served in Iraq; nearly 4,500 fallen Americans who gave their last full measure of devotion; tens of thousands of wounded warriors and so many inspiring military families. They are the reason that we can stand here today. And we owe it to every single one of them, we have a moral obligation to all of them to build a future worthy of their sacrifice."